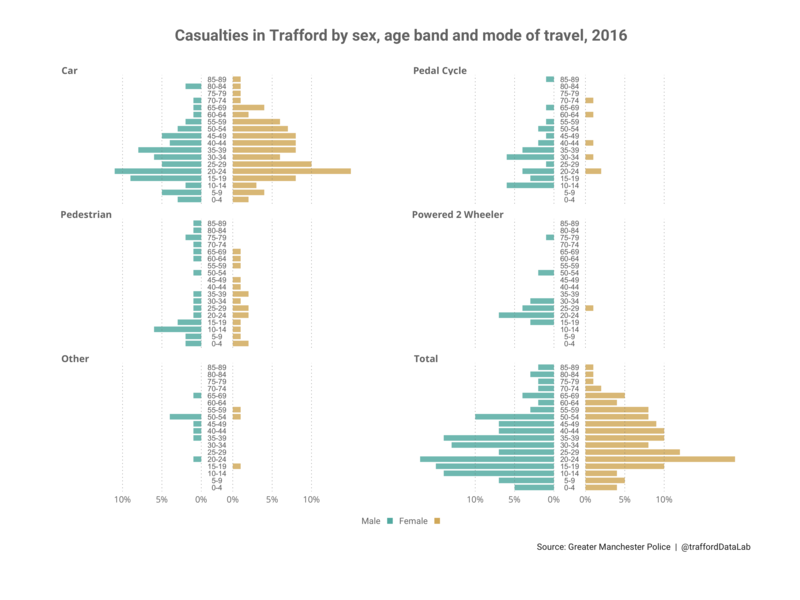 This page summarises personal injury road traffic collisions and casualties recorded by Greater Manchester Police in Trafford during 2016. 195 road traffic collisions resulting in personal injury were recorded by Greater Manchester Police on Trafford's roads during 2016. This represents 65 fewer collisions than during the previous year. These collisions resulted in 276 casualties of which 4 were fatalities, 33 involved serious injury and 239 slight. The previous year recorded the same number of fatalities but a greater number of serious (51) and slight (312) injury. Killed or seriously injured (KSI) casualties dropped by 18 compared with 2015. 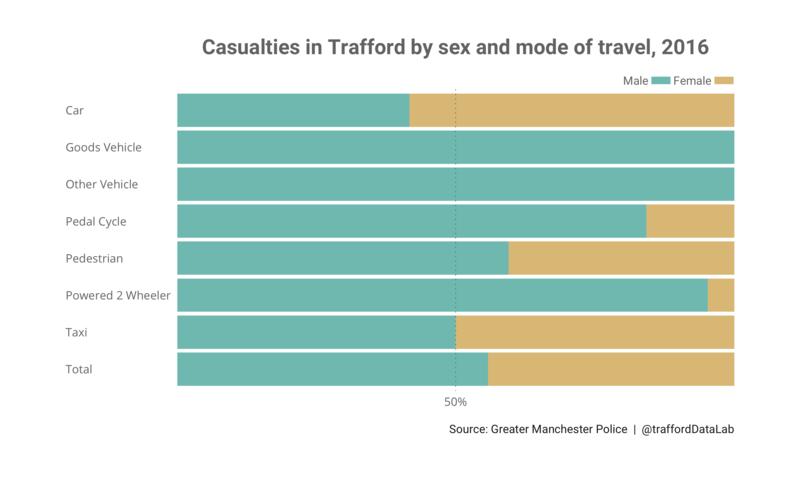 Car occupants accounted for 59.1% of all casualties recorded on Trafford's roads in 2016. Pedestrians, pedal cyclists and powered two-wheeler riders made up 36.6% of all casualties, 50% of all fatalities and 56.8% of all KSIs. Gorse Hill and Davyhulme East recorded the highest number of casualties during 2016 with 37 and 36 injuries respectively. Davyhulme West recorded no casualties at all. Figure 1 shows the number of total casualties by ward and mode. Females accounted for 44.2% (122) and males 55.8% (154) of casualties recorded during 2016. However, there was considerable variation in the proportion of male and female casualties between modes (Figure 2). Males accounted for 95.2% (20) of powered 2-wheeler casualties, 84.2% (32) of pedal cycle casualties, and 59.5% of pedestrian casualties. Females were more likely to be casualties as a car occupant (58.3%). These proportions are likely, in part, to reflect the mode of travel choices made by males and females. Of child casualties (0-15 years), 69.2% (9) of females were car occupants and 30.8% (4) pedestrians. 38.5% of males were car occupants (10) or pedestrians (10) and 23.1% were pedal cyclists (6). Of young adult casualties (15 to 39 years), 78.3% (47) of females were car occupants and 13.3% (8) pedestrians. 47% (39) of males were car occupants, 21.7% (18) were pedal cyclists and 20.5% (17) powered 2-wheeler riders. Of middle-aged casualties (40 to 64 years), 79.5% (31) of females were car occupants. 48.4% (15) of males were car occupants and 19.4% (6) were pedal cyclists. Of older casualties (65 or more years), 80% (8) of females were car occupants. 42.9% (6) of males were pedestrians and 28.6% (4) were car occupants. Figure 4 shows the month collisions occurred by mode of travel. November recorded the highest number of collisions (15.4%, 30) and August the lowest (4.6%, 9). Figure 5 shows the day and hour collisions occurred by mode of travel. Friday recorded the highest number of collisions (20%, 39) and Thursday the least (11.8%, 23). The peak hour for collisions was 1800 with 9.7% (19) of the overall total recorded. Peak periods were between 07-1100 hours (38.8%, 64) and 1300-1900 hours (58.2%, 96). 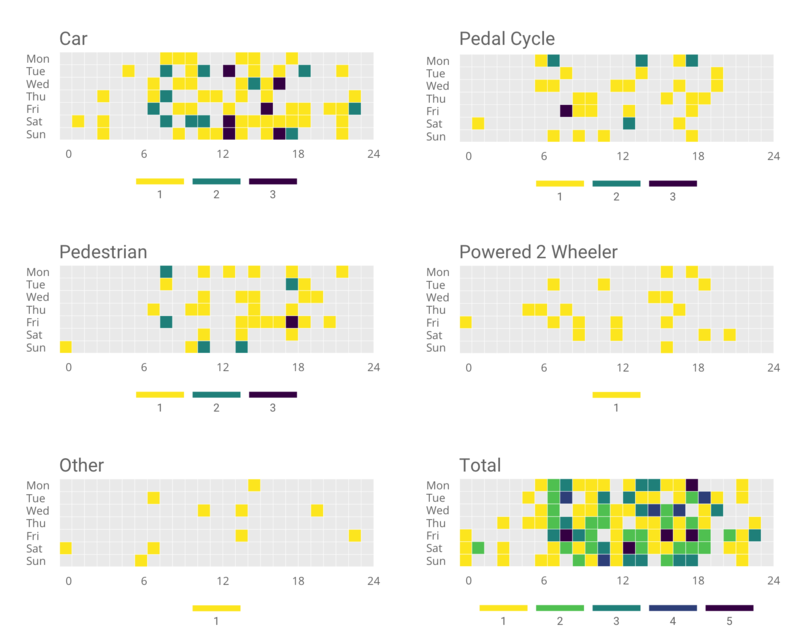 The peak hour by mode was 1300 hours for cars (11.2%, 10), 1600 hours for powered 2-wheelers (19%, 4), and 1800 hours for pedal cycles (13.5%, 5) and pedestrians (19.5%, 8). 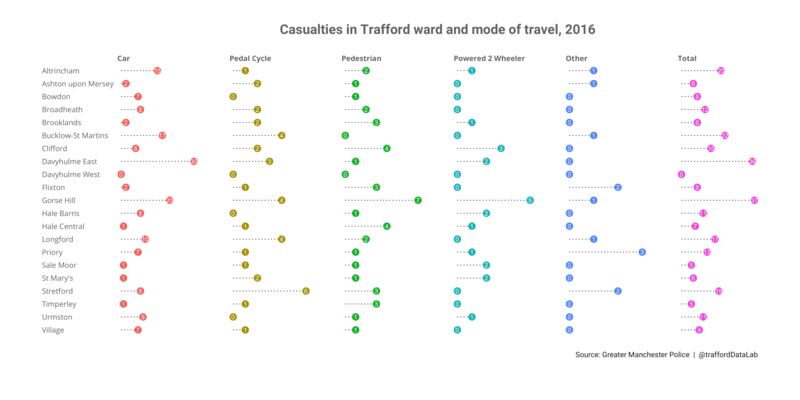 Further road casualty information can be found on our Trafford Road Casualty Map, an interactive web application that allows users to explore data for Trafford (and Greater Manchester). Transport for London's Casualties in Greater London during 2016 report provided valuable guidance about what content to include in this report. The road casualty data with pre-processing R code can be found in the road_casualties folder of our open data GitHub repository.